Found 27 blog entries for June 2011. Thursday, June 30th, 2011 at 10:09am. Stan & I are Brokers with “The Cascade Team!” We are sooooo “EXCITED” to share this wonderful news with all of you! What does that mean to you? We’ll continue to provide you with even more exceptional service! We like to call it, SOS….. SIMPLY OUTRAGEOUS SERVICE! NOT OUTRAGEOUS COMMISSIONS! We’re still abellahomes providing SOS with The Cascade Team! Thursday, June 30th, 2011 at 8:53am. Wednesday, June 29th, 2011 at 9:38am. We are very happy to welcome Stan and Marisa to The Cascade Team. They have both worked for Sammamish Realty for the past several years and were the top performing agents for Sammamish Realty. Stan and Marisa do business under the banner of Abella Homes. We are very excited to have them join The Cascade Team! They will in fact have their very first listing with us going live later today with several more coming right around the corner. We are very excited to bring such high quality brokers over to The Cascade Team. They will also be helping with the Snoqualmie Ridge sno-cone booth so hopefully many of you will get a chance to meet them and say “Hello” there. Monday, June 27th, 2011 at 9:36am. 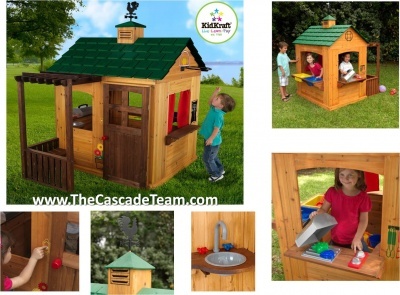 The Cascade Team (Sno Cones) The Cascade Team will also be giving away a child's Play House. Register for the drawing during the event. Grand Prize WINNER will be selected just before 2:00 on July 4th, 2011. Winner must be present to win.... The Cascade Team will arrange for delivery! Monday, June 27th, 2011 at 9:18am. Sunday, June 26th, 2011 at 8:51am. Living close to a body of water has its share of real estate perks — water views, waterfront properties, private beaches, and personal boat launches are a few top-of-mind examples. One type of real estate that ultimately takes advantage of water, however, is the floating home. Perhaps the most popular floating home was the one used in the hit movie, "Sleepless in Seattle," starring Tom Hanks and Meg Ryan. Not to be confused with a house boat -- which is mobile and can move around -- a floating home is permanently attached to a dock, is connected to a sewer system and does not have its own means of propulsion. But, like a house boat, it has incredible water views. Saturday, June 25th, 2011 at 6:28am. Sophisticated down town living at Washington Square in a luxurious 2 bed residence. Slab granite kitchen with island, new stainless steel appliances and hardwoods. Two spa quality baths with granite and tile. Amazing floor to ceiling views on 2 sides, large deck and air conditioning for summer. 2 car secure garage and storage. Premier amenities include 24 hr concierge, spa, fitness center, huge owners lounge with full gourmet kitchen, dining, pool table and TV. Walk to shop, dine and play. Saturday, June 25th, 2011 at 6:21am. Thursday, June 23rd, 2011 at 1:07pm. Thursday, June 23rd, 2011 at 12:13pm. 4 bedroom, 2.75 bath located in quiet cul-de-sac. Large quiet park-like backyard with lots of space for gardening, entertaining or for play. Upstairs is an open-concept space with large kitchen island and stainless steel appliances. Upstairs has deck off of the dining room and the living room has a fireplace. Downstairs is fully finished with a bonus room, family room and a 3rd bath. Family room is large with a fireplace and opens up to the back yard. Easy access to I-90.